Plaza Arturo Prat. Wikimedia Commons, by Freddy Alexander Bugueño Tolmo. 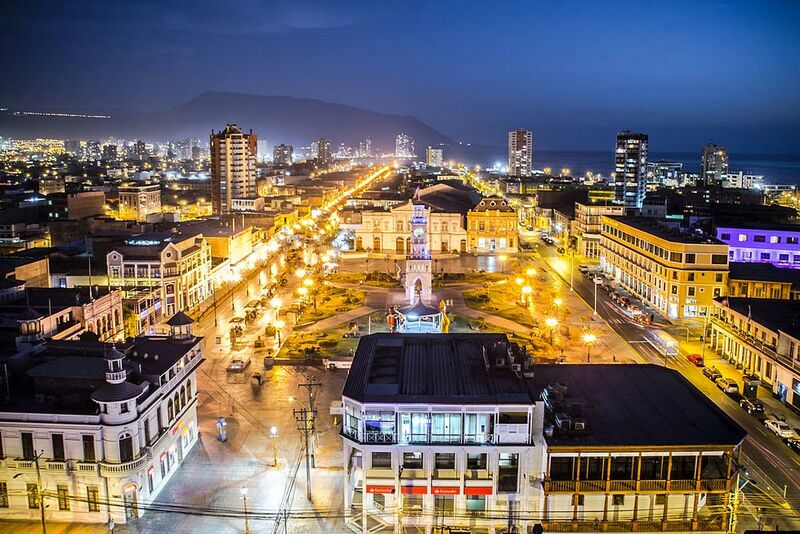 Iquique, one of the most attractive cities in Northern Chile, is a historical and modern seaport at the same time. Historical since in its bay, in 1879, the city still being a Peruvian port, under the context of the Pacific War between Chile, Bolivia and Peru, was carried out the Naval Battle of Iquique, one of the most heroic deeds of the History of Chile. Modern and of rapid growth in the last decades, thanks to the existence of the Free Trade Zone known as ZOFRI (Zona Franca de Iquique). Iquique is not a large city (only 180,600 inhabitants according to the 2012 census), but it has a great patrimonial and historical value, reflected in many details that can be appreciated by walking its streets and surroundings. Here is a list of the most popular tourist places in Iquique, also known among the Chileans as "Tierra de Campeones" (Land of Champions), since the city has been the cradle of many great sportmen and women. Playa Cavancha meets the conditions to be the most popular beach of the city. Close to the old quarter flanked by the Avenida Costanera Arturo Prat Chacon (Waterfront Avenue), Hotel Gavina on the North and Cavancha roundabout on the South, in addition to being surrounded by a modern residential architecture and a pedestrian promenade. Although the coasts of Chile are colder than in the Atlantic (due to the Humboldt Current) in Cavancha the sea is warm and you can swim all year round. The beach is extensive and there is always some entertainment. The northern sector of the beach, characterized by intense waves, is suitable for water skiing, sailing, surfing, windsurfing and body boarding. To the South lies Playa Brava, 4 km. away from the downtown in a very developed area of the city. As its name suggests, this beach is of strong swell and not suitable for bathers, however you can practice sport fishing and several water sports, besides being an ideal place for sunbathing, paragliding, with a series of additional attractions that draw the attention of thousands of visitors daily. Playa Huayquique, beautiful beach situated 5 km. South of Iquique, excellent for surfing and bodyboarding when the wave conditions permit, without the massive attendance of Cavancha what makes it special for sunbathing. Another beach is Playa Blanca, located 13 km. South of Iquique, of white sands and transparent emerald waters, suitable for swimming, sport fishing, diving circuits and the practice of various water sports. Perhaps the most emblematic symbol of Iquique, in the middle of the Plaza de Armas (Arturo Prat Square). The Torre del Reloj, construction imported from England in 1878, erected by order of the Peruvian Government, (since in those years Iquique was a Peruvian city), is a National Historic Monument that constitutes one of the most representative urban expressions of the "nitrate era", built in Oregon Pine, material impossible to find in a region surrounded by the Atacama Desert. The engineer of French origin Eduardo Lapeyrouse, had ordered the design of the tower and the clock to Europe in 1877, Lapeyrouse was later the first Mayor of Iquique when the city became Chilean in 1879. Traditional pedestrian walk of fifteen blocks, bordered by luxurious old mansions, from the time of the golden decades of the Chilean saltpeter, during the late nineteenth and early twentieth centuries. Since 1977, National Monument of Chile, under the category of Typical Zone, nowadays it is considered one of the most emblematic and historical sectors of the city. Paseo Baquedano is one of the must-see tourist circuits where the buildings seem to have remained in the past, when the train coming from the "Oficinas Salitreras" ran along this route. The Municipal Theater is located in front of the Plaza de Armas, it was built in 1889 and formally inaugurated on January 1, 1890, during the time of the economic splendor generated by the exploitation of saltpeter (1880- 1930), it is almost entirely built in Oregon Pine brought from the United States. Due to its central location is very accessible, the visit to the building is interesting although without guides, you can observe furniture of the time. 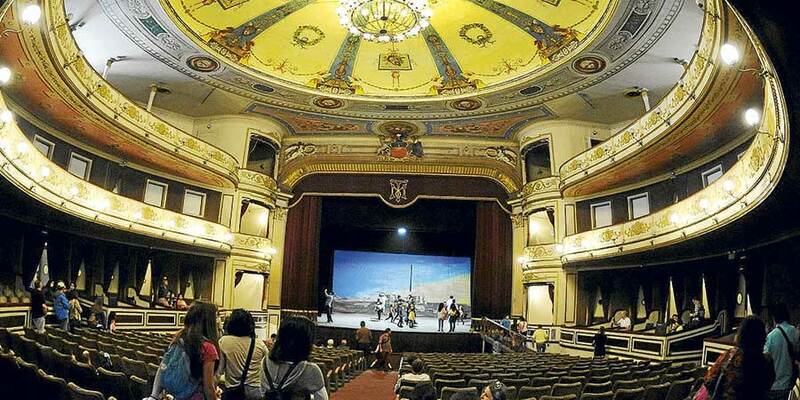 It should be pointed out that very soon the Municipal Theater of Iquique will be restored, repair works would begin during the first half of 2017, with an investment of about US$ 8,500,000. Address: 951 Paseo Baquedano, ground floor. Founded in 1960, under the patronage of the Universidad del Norte, since 1982 run by the Corporacion Municipal de Desarrollo Social de Iquique. The building was built in 1892 and originally its facilities housed the first "Intendencia de Tarapaca" and then the Court of Justice. The Museum consists of three areas: anthropological, ethnographic and historical. 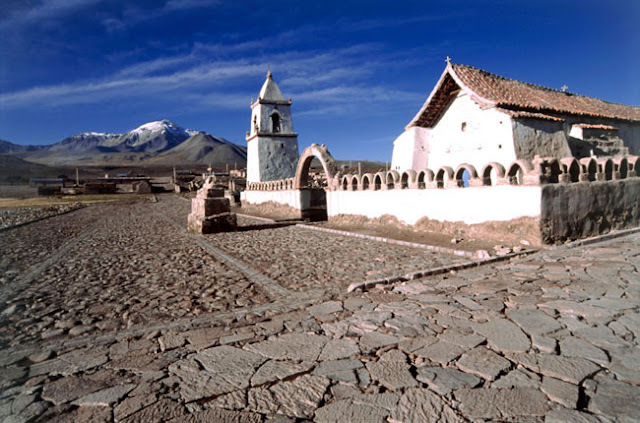 In the anthropological area we can know the history since 10.000 years ago such as the communities Chinchorro, Aymara and other cultures that had influence on the current North of Chile, the Tiwanaku (Tiahuanaco) and the Inca culture. Within the ethnographic area is possible to know the way of living of the peoples of the high plateau, such as the Aymaras, from its beginnings to our days. The historical part of the museum shows the history of the "Nitrate era", from beginning to end. One of the must-sees in Iquique, to know a little of the history of Chile, located on Arturo Prat Avenue with Paseo Almirante Lynch. Inaugurated in 2011, this ship museum is a replica of the Esmeralda corvette belonging to the Chilean Navy, sunk on May 21, 1879, during the Pacific War. A surprising realism is achieved because every detail has been considered, to build it, the original plans were requested to England, it was also made an investigation in the sink ship so that the museum was as accurate as possible. The sound of the sea, heard in every corner, makes many believe the ship moves, although in reality it is on land. Without being a tourist place, ZOFRI is one of the most visited sites of the city as it is the largest shopping center in Northern Chile and one of the the two Free Trade Zones existing in the country, with a significant commercial exchange with nations of the region such as Argentina, Bolivia, Peru, Paraguay and Brazil. 46 km. East of Iquique are located the former mining towns of Santa Laura and Humberstone, declared a World Heritage Site. They are like "ghost towns" of what once were true cities called "Oficinas Salitreras", when at the end of the nineteenth century and the beginning of the twentieth century Chile was the first World producer of saltpeter. It should be noted that during the saltpeter boom, there were more than 200 "Oficinas Salitreras" working in the middle of the desert. This boom lasted until synthetic saltpeter was invented in 1930. A little more than 230 km. Northeast of Iquique, bordering Bolivia, lies Parque Nacional Volcan Isluga, at an average altitude of 4,000 mts. above sea level. This protected area, within its 174,744 hectares hosts one of the most impressive concentrations of biodiversity associated to the high Andean ecosystem, with the typical landscape of the precordillera, the high plateau and the little towns nestled in the mountains. To the East you can see the imposing silhouette of the Isluga Volcano that dominates the area with its 5,500 meters high, which gives the park its name. In addition to the Isluga Volcano, there are also other big mountains such as the Quimsachata (5,400 m.), Tatajachura (5,252 m.) and Latarama (5,207 m.), Geysers and Hot Springs. National Reserve located 70 km. to the interior of Iquique, in the communes of Huara and Pozo Almonte. So called by the presence of the Tamarugo, endemic tree of Chile that inhabits the North of the country, characterized by growing in barren environments, characteristic of the zone. The fauna of the place is scarce and the largest amount of animals that survive the dryness of the terrain are the reptiles, like Lizards, small Snakes as well as other 18 species of protected birds, including the Comesebo of the Tamarugo, Eagles, Owls, the Pequen, Red-headed Buzzards, Culpeo and Chilla Foxes. The Reserve also houses invaluable samples of cultural heritage. One of them are the Geoglyphs of Cerros Pintados, considered as a place of scientific and archaeological interest, declared in 1969 as a National Monument. The Geoglyphs consist of more than 450 anthropomorphic, zoomorphic and geometric figures, distributed along three kilometers. Its creators, probably members of the Tiwanaku culture, drew them more than 500 years ago. To preserve these valuable vestiges, in the area there is a Museum and Information Center of recent creation. For its part, the CEDAM (Environmental Education Center), located in the area of the administration, free all year round, offers a complete cultural and environmental history of this part of Northern Chile.